Modern economics assumes that a gradually increasing supply of money is needed to ensure that economic growth is not constrained. Their problem with metallic money is that it does not grow fast enough. The implication is that as the economy grows, prices and wages have to slowly decline. This was the situation during much of the nineteenth century, which was a time of rapid economic growth arising from the industrial revolution. Most economists believe that it is difficult to get this downward flexibility and that it is more sensible to run an economy with nominal GDP growth of 4-5% price inflation of 2-3% and real GDP growth of 2-3%. Monetary growth is needed to ensure GDP growth is not constrained. There is a moral flaw to this argument. Monetary inflation robs savers of their wealth. Over twenty years, the purchasing power of savings is halved, if inflation averages 3% per year. That is painful, if you are living on your savings, as many people do. Over the last few decades, inflation has been much greater than 3%, so the loss has been even greater. This is theft, so it is morally wrong. The argument that prices are sticky downward is wrong. Every time we go shopping, we see specials and offers of discounts. Clearly, retailers are quite happy lowering prices. Prices of electronic goods have declined continuously over the last few decades, without any disruption of the market. Wages are sticky downward, but that does not matter. If all prices are declining slowly, and nominal wages are unchanged, then real wages are increasing. This is what should be happening in a vibrant economy. Improvements in productivity due to technological advances should allow business to reduce their prices. So over time, prices should be declining slowly. This increases the real value of wages, without any need for industrial pressure. This is the true trickle down. Gradual inflation robs workers of this technology dividend. If prices are rising slowly, real wages will decline, unless employees can persuade employers to pay more. This is hard, because the truth is that wages are sticky upwards too. Under inflation, the benefits of technology are captured by the richer people whose income comes from capital gains. Contrary to the economists, an economy with gradually falling prices would be better for wage earners and people on fixed incomes. They would share in the benefits of technology and improvements in productivity without having to use the industrial muscle of union or political power. Most economists assume that private credit creation by banks is the best way to ensure sufficient aggregate demand. Several reasons have been put forward to justify the need for credit creation. They are flawed, but we need to understand them. One possible reason for credit creation might be a shortage of saving constraining capital investment. If people do not save enough, then economic growth could be slowed. Lack of savings is a serious problem in many economies, but credit creation is not a solution. At the level of real activity, investment must be matched by savings. When an economy produces capital goods, there has to be forgone consumption as fewer consumer goods are being produced. If Robin Crusoe devotes time to making a net, he will have less time for fishing. He will have to consume less for a while, so he can build up a supply of fish to eat while he spends time making the net. In a complex economy decision about investment and saving are made by different people, so intentions about saving and investment could get out of line. Business might produce more capital goods than savers are willing to fund. If that happens, there will be a surplus of investment goods and a shortage of consumption goods. Creating credit might seem like a solution, but it is not. It actually makes the situation worse, because central banks adjust interest rates to encourage the banks to create credit. When the central bank controls interest rates, the price information that savers and entrepreneurs need to make good decisions are distorted. It is better to let the interest rate adjust naturally until savings and investment come into line. Quick money schemes have an appeal, but there is no escape from the need for saving. The most common argument in favour of credit creation is that nominal demand is sometimes insufficient to produce economic growth. Central banks believe they can increase growth by increasing the supply of money. This argument is flawed, because the increased demand does not cause production of goods and services. Rather production creates demand for the goods and services. This is summarised by Say's Law, which says that the supply of goods and services creates its own demand. In a barter economy, if I have produced something for exchange that creates a demand for something that someone else has produced. In a complex economy, the wages and salaries and profits earned through the production process create the demand for the goods and services produced. Say claimed that production is the source of demand. One's ability to demand goods and services from others derives from the income produced by one's own acts of production. Wealth is created by production, not by consumption. My ability to demand food, clothing, and shelter derives from the productivity of my labor or my nonlabor assets. The higher or lower that productivity is, the higher or lower is my power to demand other goods and services (Says Law). What can happen is that entrepreneurs make the wrong types of goods and services. They might produce too many cabbages when people are wanting more pumpkins. These problems are easily solved. Prices will adjust and businesses will adjust their production to clear the market. Credit creation just exacerbates the problem by making it seem as if there is demand for the things that people did not really want. This rewards the entrepreneurs who made bad decisions, which is like to make the situation worse in the future. A common argument for allowing banks to engage in credit creation is that liquidity is needed for markets to function. You cannot buy what I have produced until you have sold what you have produced. However, Jack cannot buy what you have produced until I buy what he has to sell. Trade appears to be stymied. This is an old problem, but people have always found a problem to solve it by offering credit to each other. All it takes to get trade moving is for someone to say to someone they trust, you can pay me when you have sold what you have produced. Societies have found various ways to make sure trade take place, without the need for banks to create credit. A common argument for increased money supply is that it is needed to finance seasonal production. This is an illusion. If I sow wheat in the ground, I will not reap a harvest until six months later. If I do not have any spare grain, then I have to get some grain from another person to avoid starving. That grain will not be available for someone else to consume. This shows that season activities, where production takes a long time to be complete, has to be supported by real saving. Creating credit for seasonal finance will distort supply and demand. The accepted wisdom that credit creation is needed to foster economic growth is flawed. Credit creation, whether by banks or governments, is theft. It allows the people who get the created credit to buy something that really belongs to someone else. While economists are stuck with the idea that growth in nominal demand must be funded by credit creation, they will continue to create problems for their economy. The GFC is the most recent example. The standard textbook explanation of money creation says that central banks create money, which is then expanded by a multiplier effect in the banking system. This explanation is now being rejected by economists. They are now acknowledging that banks create money by making loans. It records the loan as an asset on its balance sheet, at the same time as it puts the money in the borrower's account. At that point, the bank has created money and credit. They may be constrained due to the need for reserves at the central bank or the need to make a profit, but banks create money. The benefit of private credit creation is that is disciplined by the market, which theoretically ensures credit to be allocated efficiently. Orthodoxy says that if the interest rate is set to equal the natural rate of interest, the right amount of credit will be produced by the banks. Banks are not unique in being able to create credit. Any individual can create credit too. If I supply you with goods or services and say that you can pay me in a year's time, I have create credit. However, I can only give away stuff that I do not need for the next year, so there is a serious limit on how much credit I can create. I have to give some goods or services that I have produced or bought in exchange for an IOU from the borrower. Unless I am rich in resources, I will not be able to give much credit. Businesses can create credit, too. If it supplies goods or services to a person or another business, and agrees that no payment is required until a year later. This credit becomes money, because the person can use the money he would have paid to the business to buy something else. However, a business has the same constraint on the amount of credit that it can create, as a person. It has to supply some goods or services to the borrower in exchange for the security it receives from the borrower. Creating credit will reduce its stock of goods or supply of cash in the bank. It can only lend stuff that it does not need for the ongoing operation of its business. The amount of credit created will be small, because most of its resources will be needed to keep the business operating. 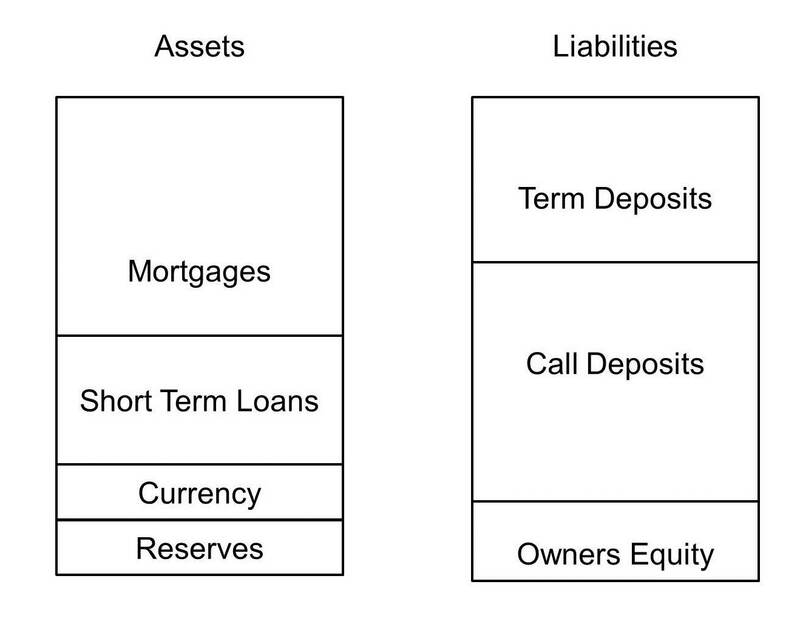 A businesses balance sheet looks like this. The business needs its capital equipment and building for ongoing production. 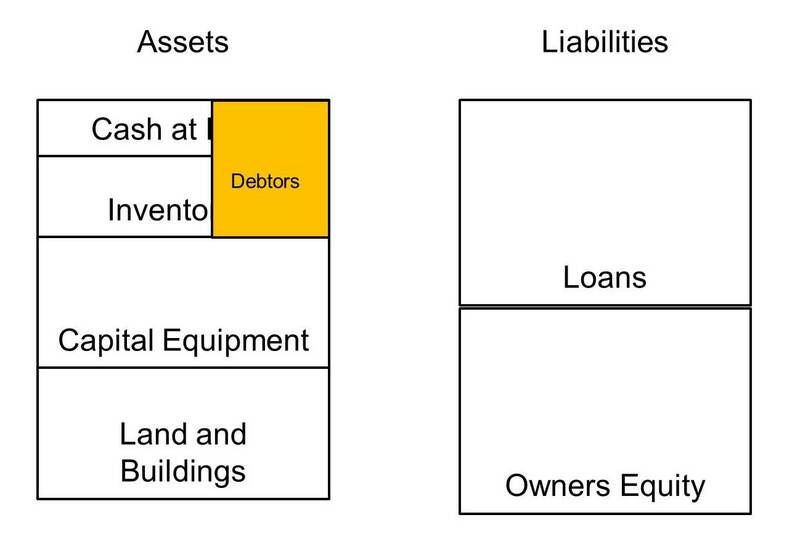 Therefore, unless the business is willing to borrow the money it lends, it has to turn some of its cash at the bank or stocks of inventory into loans to debtors. This significantly limits the amount of credit it can give. Banks create credit. 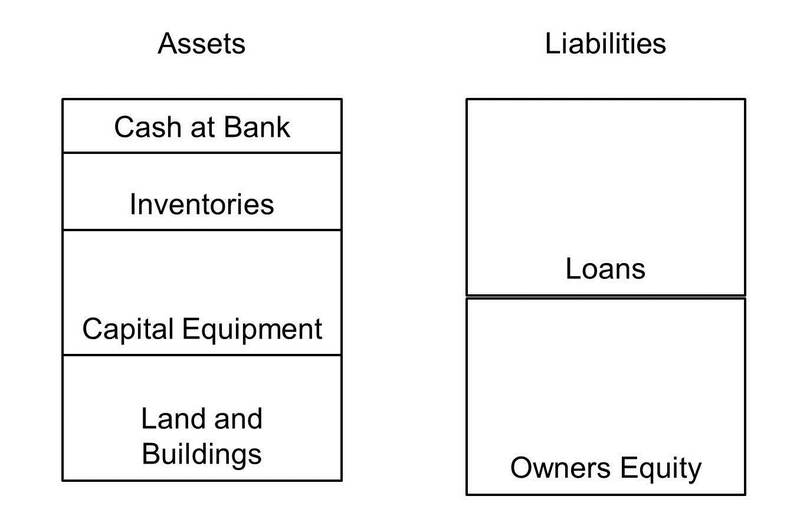 However, the structure of a bank balance sheets means that it is not so constrained as other businesses. 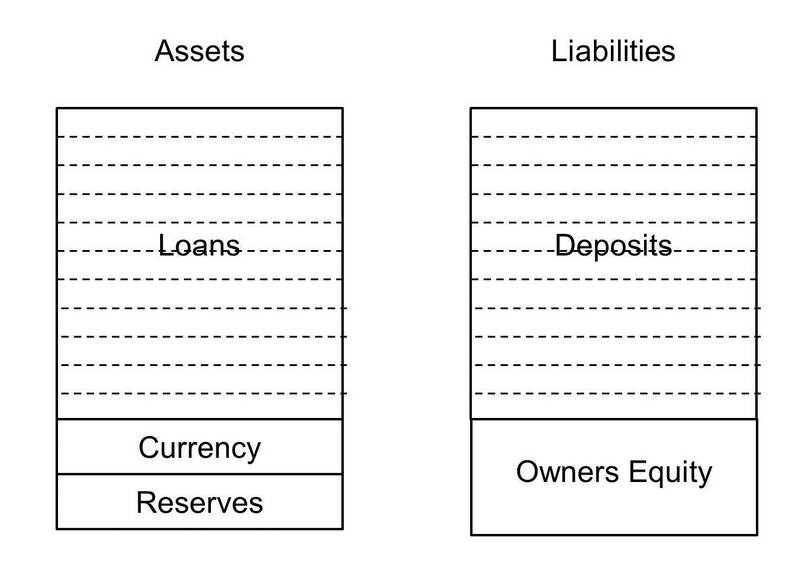 Due to fractional reserve banking laws, only a small part of the bank's assets are needed for the support of its ongoing business. They do not need to use their currency to make a loan. 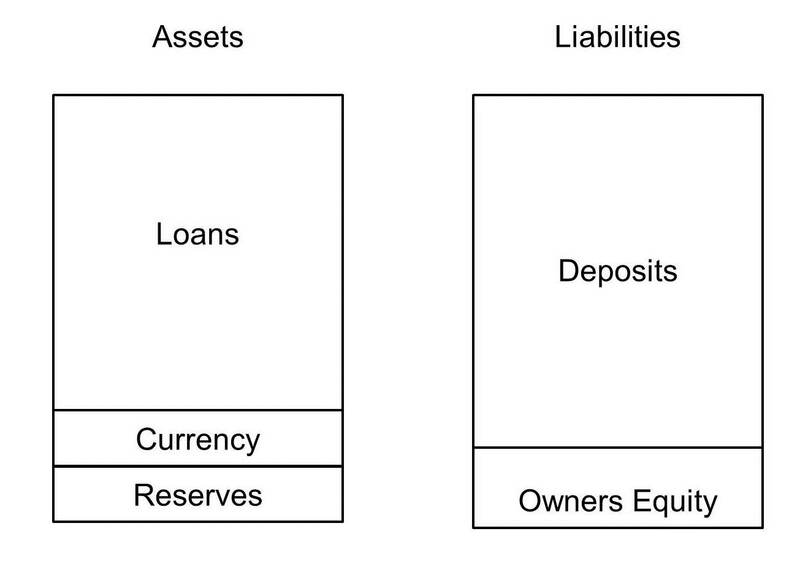 Reserves at the central bank cannot be lent to private individuals. When making a loan, the bank simply records a deposit in its client's bank account. They record this deposit as a liability on the bank's balance sheet. 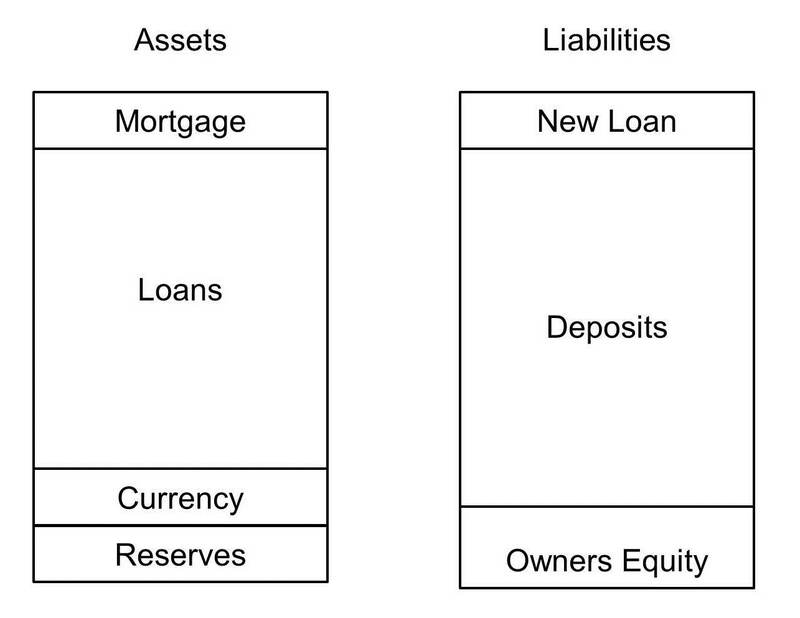 The mortgage is recorded on the other side of the balance sheet as an asset. Banks are not constrained like other businesses. 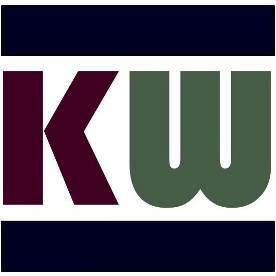 Only a small part of their assets are needed to support their ongoing business. All they have to do is keep enough reserves of currency or at the central bank to cover potential withdraws of call deposits. Deposit insurance means that their reserves can be kept quite small. Banks are different from businesses. They do have to give up anything when giving credit to a borrower. Banking laws give them the right to give borrowers something they do not own. Understanding this is easier, if we think about the situation when banks began as goldsmiths storing gold. People deposited their gold with the goldsmith for safekeeping. Rather than withdrawing gold when they needed to make a payment, they would exchange the goldsmith's receipts. These receipts acted as money. The goldsmiths realise that only a fraction of the gold was withdrawn at any one time, so they began lending some of it out in return for an interest payment. All the gold belonged to the people who deposited the gold. The goldsmith bank did not own any the gold (although it would record on its balance sheet). When it loaned gold, it was lending gold did not own. It was cheating because it was lending something that did not belong to it. Now that we have switched to fiat money, the same situation applies. Banks can lend out money that they do not own, just as a goldsmith bank lent out gold it did not own. The law allows banks to operate in this way. No other person or business has this right. Fractional reserve laws give banks a huge capacity to expand credit. This has been a major cause of instability in economies everywhere. Banks are different from other businesses in another way. Most of the money that lend comes back to them. The bank deposits the money in the account of the person taking out the mortgage. It will not stay there, because the borrower will write a cheque to pay the person they are buying a house from (ignoring the solicitors for simplicity). The house seller will deposit the cheque in their bank account, most likely a different bank. The borrower's bank will have to transfers reserves to the seller's bank to cover the cheque. The seller might need to use some of the money to pay for goods and services. They might buy some shares or units in a superannuation fund. The money will end up in the banks of the businesses selling these things. The big difference is that the money ends up being deposited in a bank account. Whereas, when a business gives credit to a customer, they hand over good or services to them. They do not get anything back until the loan is due. The money does not come back to their business. The credit created by the bank issuing the mortgage would end up in accounts at other banks. However many other loan transactions would be going on at the same time. The homebuyer's bank would most likely have some money paid into the accounts of its depositors relating to these transactions. It would receive Central Bank reserves from other banks to cover these cheques. All the transactions could cancel each other it, so the bank might need to give up any reserves at all. If this happened, the bank would have received back all the money that it has loaned out. This difference allows a bank to create an immense amount of credit, provided all other banks are doing the same. When I create credit, I get an IOU from the borrower. It has limited value, as most people will not know the person who issued it like I do so they will have no reason to trust them, even if I do. It will be quite difficult for me to sell it someone else, if I need my money. When a business creates credit, it will get some kind of security in return. It will be quite hard to exchange it for money, unless the person or business granted credit is widely known and trusted. The security might be difficult to sell, if the business finds it needs cash for some reason. Banks are different. They can sell securities to the central bank and get currency in return. This currency is legal tender, which is mandatory for settling debts. This gives the bank a big advantage when creating credit. Banks have the ability to lend long and borrow short. This makes it easier for them to create credit. They can create a new twenty-year mortgage and keep the balance sheet balanced by taking short-term deposits. A person or business cannot do this. If the business wants to give it clients twenty-years to pay, it locks up some of its cash or stock for that length of time. I have described a Warehouse Bank which must match the term of its loans with its deposits. To make a loan of a particular term, the bank would have to attract equivalent deposits for the same time. This would limit its ability to create credit, because it would be limited to true intermediation. If I lend you my combiner harvester, you would not record it as an asset on your balance sheet. Yet that it what banks do, when I deposit money with them for safe keeping. This gives them the right to lend the money to someone else. I think the money belongs to me and is ready for me to use whenever I want it. They have given it to someone else. If my friend gave my combine harvester to someone else to use without asking me first, I would be a bit upset. However, banks do this all the time. I would not promise my combine harvester to another person without checking when they planned to do their harvest. I would want to make sure my harvest would be done first, or that they would be completed theirs, before mine was ready. The agree would sort this stuff out, so that I was no left in a situation where I lost my harvest. Our contracts with banks are too vague. People depositing money in a bank have different intentions. Some will be transactions money left in my bank between payday and when my rent is due, or I can get to the supermarket to buy my groceries. Some is money that I do not want to use for a while, because I am saving to buy a new computer in about six months time. Some will be long-term savings for when I retire. The bank does not know my intentions. We need deposits with contracts appropriate for the various purposes for which I deposit money in the bank.